Congratulations to new national champions, Verdes FC! BELIZE CITY, Thurs. May 21, 2015–I haven’t seen the Channel 5 report yet, but I have been reliably informed by fans behind the southern goal at the Norman Broaster Stadium on Sunday, as well as those who saw the Monday Sports Report, that Jarret’s series and championship winning goal was a “professional slap into the far corner,” not a header as we erroneously reported in our mid-week issue. From midfield, near the official desk on the western sideline, where I trained my camera on the goal area, I couldn’t follow the trajectory of Shamir Pacheco’s free kick from near the eastern sideline. My Canon camera was focused on the goal area; and with Jarret’s back toward me, I missed the moment of impact, and was lucky to catch the ball in flight before it reportedly hit under the crossbar and entered the net for the 2-nil Verdes win. Because of the sudden change of direction of the ball, headers are the most difficult shots for a goalkeeper, and Jarret’s left footed volley was just as nightmarish for All Belize goalie Woodrow West, who made a great effort. It appeared to us that the Bandits had the better of play overall in Sunday’s championship final, but Verdes produced two absolutely spectacular goals, a header into the right “pigeon hole” by Brazilian Alcides Thomas (31’) in first half, and the left footed slap-volley again into the right “pigeon hole” in injury time by Jarret Davis (90+’). The 2-nil win was enough to give Verdes, the championship, after losing 1-nil to the Bandits a week earlier at the FFB Stadium. The game was ably, officiated by Belizean FIFA referee Christopher Reid. Goals:Verdes FC–Alcides Thomas 31’; Jarret Davis, 90+’. Verdes FC – #11 Benito Moreira (goalkeeper); #18 Victor Cruz; #19 Evral Trapp; #3 San Mendez; #6 captain Rodney Pacheco; #7 Nahjib Guerra; #16 Jesus Patino (#9 Gilroy Thurton 73’); #21 Delroy Andrews; #8 Ricardo Jimenez (#34 Ryan Gill 71’); #14 Alcides Thomas; #10 Jarret Davis. Coach–Walter Salazar, assistant–Marvin Ottley. Belmopan Bandits FC – #1 Woodrow West (goalkeeper); #24 Dalton Eiley; #20 Ernest Wiltshire (#23 Tyrone Pandy 76’); #2 Erick Rodriguez (#16 Jordy Polanco 45’); #3 Norman Anderson; #15 Jerome James; #12 Denmark Casey; #11 Khalil Velasquez; #14 Edmund Pandy, Jr.; #21 Jehoshaphat Nnadi (#17 Marvin Centeno 63’); #4 Elroy Kuylen. Coach–Edmund Pandy, assistant–Jorge Nunez. 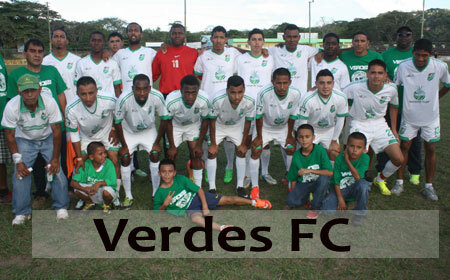 As Premier League of Belize 2014-2015 champions, with 2-seasons aggregate advantage over the Bandits, Verdes FC will get to represent Belize in the CONCACAF Champions League 2015 later this year.